On January 16 Synology released the public beta of its new Disk Station Manager 4.0. I’ve wrote a post on how you can install this beta onto your DiskStation (post is in Dutch). 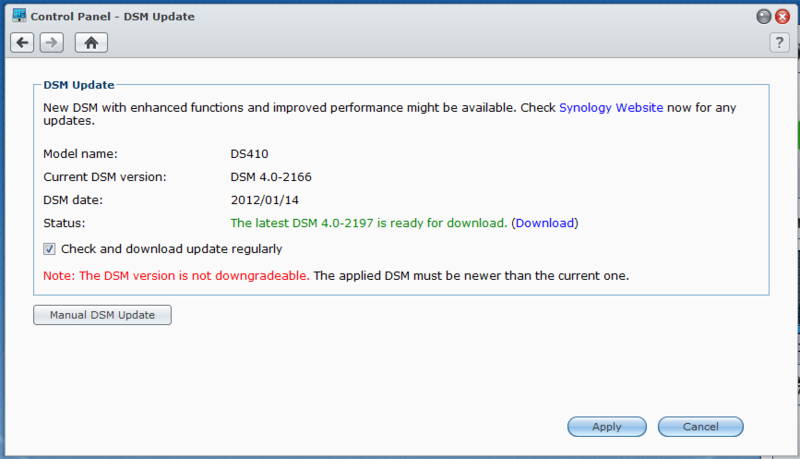 Today Synology released the final of 4.0, all 3.x users can update DSM using the ‘Control Panel’, ‘DMS Update’ snapin. Just click ‘check DSM update’ (if your DS is not checking automatically), DSM will notice you that there’s a new version available, click ‘Download’ to get the new version 4.0 of Synology DSM. After the download you can click ‘Update Now’. Now we wait a few minutes allowing DSM to install.